The pot you see pictured above is a traditional Chinese Claypot, also sometimes known as a ‘sand-pot’. It was a gift from my wife but I have been a little hesitant to use it thus far as I understand that certain preparatory steps are necessary before cooking with it. The instructions that came with this particular pot were so woefully inadequate as to be worse than useless and the information I have found on the Internet has been a bit contradictory and confusing. There is a suggestion that the pot be soaked for an extended period in cold-water, briefly in ‘rice-cooking’ water, and there is also all sorts of information regarding cooking in the oven versus cooking on the stove-top. If any of my readers are experienced with these vessels, I would be most glad of any information or advice you may see fit to dispense. Particularly, I would be happy to learn: the basic preparation procedure; how and when this needs to be done; and, how to use the pot on direct heat. If it helps at all, this particular pot is glazed on all surfaces except the very bottom. Would “The Process: Cooking in a Chinese Sand Pot” on page 100 of The Modern Art of Chinese Cooking by Barbara Tropp be of any help? HAH … Yes! I have a copy (p.98 in my edition)…. I would have seen it before but, not having a sand-pot then, I forgot all about it.! I imagine her tips extend to my more fully glazed pot. Oh, I wish I could help! I have some glazed earthenware too that came with vague instructions. My glaze actually cracked and every time I cook in it, my food comes out looking like it is covered in glitter. The company swears those flakes of glaze are non-toxic, but you can probably guess how often I want to use it now. Good luck, John! 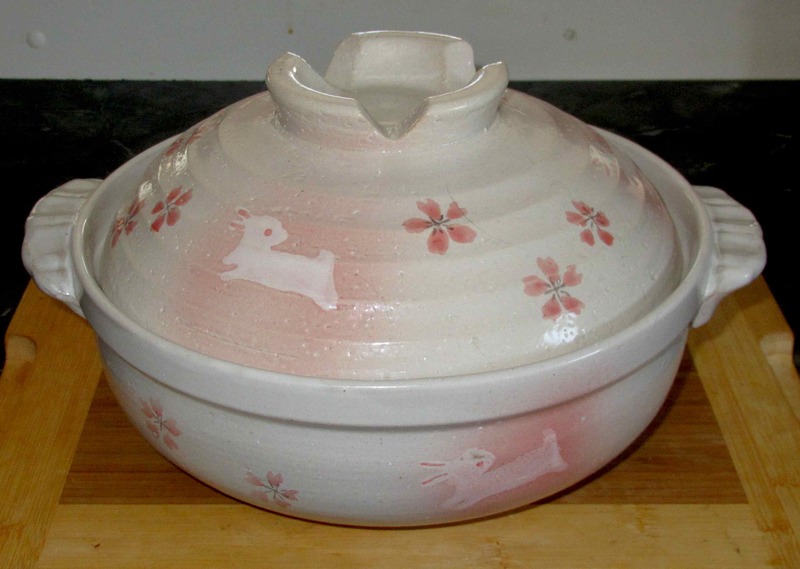 That pot is adorable with the bunnies and if you figure out how to prep it, please let us know! I have several pots like that. Most of the time used for cooking or heating in microwave oven without special preparation. Use in direct fire only with the smallest flame for long time cooking without any preparation. I have emailed my Chinese daughter in law and Beijing and hope that between her and her mother in law they will be able to throw some light on how to prepare a glazed pot. Hi there. We use clay pots in Japan all the time, especially in the autumn / winter. They are great for “Nabe” – hot pot which we do as an infomal family dinner. We set up a portable gas cooker (like the one with a disposable gas canister) and cook with the pot placed in the middle of the dinner table. 1. Rinse rice in the water and save the water. 2. Transfer the water into the clay pot – fill it up to 8/10. 3. Boil it for 10 -20 mins. 2. After boiling the pot, leave it to cool gradually. 3. Wash the pot with water only. This treatment plug the small pores on the pot and make the pot stronger. 1. Mustn’t heat the pot without liquid. 2. Mustn’t heat the pot when the exterior is wet. 3. Mustn’t put the pot over the flame when the pot is already very hot. 4. Must keep the flame less than the middle strength. 5. Once the liquid inside the pot is boiled, lower the flame & cook. As long as the flame is set no higher than middle, the pot can be placed directly over the gas flame. I've never seen anyone using the pot in the oven as using oven is not very common in Japan. Thank you! Good stuff …. these instructions should come with the pot!! The clay pot your wife bought you is the modern one. Few people would use it directly over the burner. Some very traditional Chinese people may still use clay pots to cook rice because it will come with a nice flavor if you know how to control the time of the cooking. Most people now just put the food into the clay pot like yours, as a nice container. Your reader from Japan has give great instructions for cooking rice in the clay pot. In the Chinese restaurant, there are some menus like 煲仔飯 with food like ribs on rice. I don’t think they have the food cooked directly over the fire. I still own a very nice clay pot , a bigger one than yours. I seldom use it now. My sisters only use theirs as containers nowadays. I remember I bought a cute little clay pot and gave it to my sister. She liked it so much that she never used it! Sorry. I am not too helpful here.